We worked with Faye Lessler of Sustaining Life, a blog dedicated to all things ethical and sustainable. Using one our popular Tropical Mango tea, she created vegan chia pudding (*licks lips*) and showed that you can be sustainable and [food] stylish at the same time. You can check out her blog post to get the recipe and 15% off your first order. All photos are hers originally! Sustaining Life is a blog curated by Faye Lessler from New York, and she is a strong advocate for sustainable living. She provided her honest opinion and led her own creative direction to make this recipe! 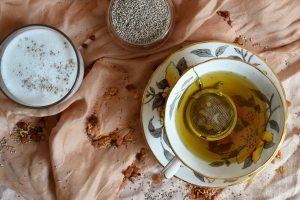 She is a member of the Ethical Writers Coalition and the Ethical Influencer Network – and she blogs about all things that are, naturally, ethical. How do our teas relate to Sustaining Life? We have similar goals – to promote something ethical in our fields. If you don’t know, our teas are actually a product of direct trade. It is a form of sourcing that allows us to establish direct relationships with our farmers (who we really call our partners) instead of using a third party. We are 100% financially transparent with our partners and make sure they are paid fair wages, in exchange for obtaining our awesome teas. Speaking of transparency, it’s important to address the flaws of direct trade and how DTC is avoiding those pitfalls. Common flaws are the fluctuating commitment of buyers, poor information exchange (lack of transparency that lead to unfair wages), and power struggles in the supply chain that can affect the quality of the products. The thing is, our founders have actually been drinking tea since birth and have known their partners long enough to build a trustful relationship with them (I mean, they let us sell 3 teas for $1 a month, if that isn’t indicative enough of mutual trust). As you’ll see from Sustaining Life’s article, our teas are also approved by the European Union Pesticide Regulations and it takes time to get a certification from them (*wipes sweat thinking about that struggle*). We have full control of information flow as we are a small but hardworking team who aims only for quali-tea. Because for both our team and our tea, quality over quantity. So, it wasn’t surprising when Sustaining Life agreed to work with us because we were headed towards a new era of consciousness for things people don’t usually think need attention. Not many people know that there are farmers working their butts off for a fee lower than what they deserve. Not many people know that there are ways to live more ethically for Mother Nature (and not just through recycling). So read on and support DTC and Sustaining Life, whether through word of mouth or social media! 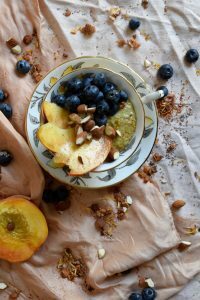 This entry was posted in Recipes and tagged chia pudding, dollar tea club, ethical, fruit tea, healthy, healthy living, loose leaf tea, Recipes, sustainability, sustainable living, tea, tropical mango, vegan, vegan recipes.